By now, many of you know... if I wasn't Italian, I would be Mexican! Not only does their culture adore their family like Italians, but their cuisine is absolutely addicting, comforting and mostly gluten free friendly. Since the new diet, I've sadly steered away from Italian Restaurant outings, because many of them have not jumped on the GF trend here in Southern California. So I was excited to learn that I could create a meal at home that satisfied my pizza cravings by combining corn tortillas with my favorite pizza toppings - mozzarella, spicy pepperoni, sauteed mushrooms and bell peppers. 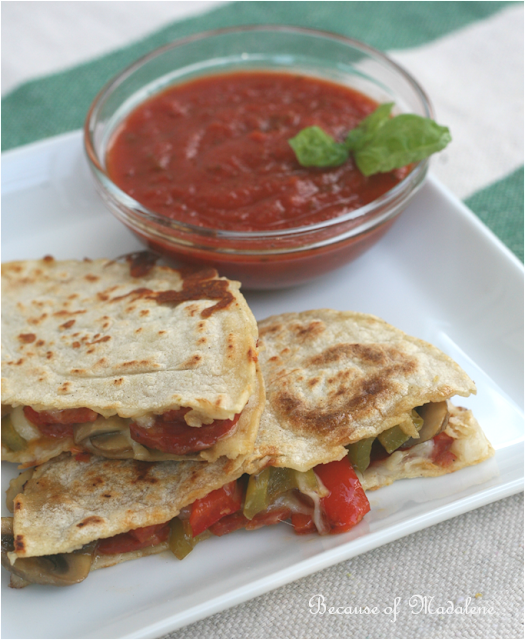 With the perfect blend of classic Italian flavors and an earthy Mexican twist, I give you my version of a hearty GF Pizza Quesadilla! In a large pan over medium heat, start melting the butter. Add the bell peppers first and cook for about 5 mins (they take longer to cook than the mushrooms). Then add the mushrooms and cook for another 5 mins until they both start to soften and slightly brown. Pour in the wine, stir and cook for a remaining 5 mins. Remove from heat. In a separate medium size pan over medium heat, build the quesadilla. Put in the corn tortilla and layer on the toppings, starting with the mozzarella then the pepperoni and veggies and finishing it over with another layer of cheese. Close the quesadilla with another corn tortilla. Flip when the bottom tortilla is golden brown 3-5 mins. Cook on the other side for another 3-5 mins. Cut in half with kitchen sheers and serve with a side of marinara. I am all about easy recipes. Whenever I see something with a hand mixer, flour, or dough involved, I immediately give up on it. This looks great! Thanks for posting! Tell me about it! I'm all about easy and quick, as well. Otherwise, I'm too tired by the end of it to even enjoy eating it. Thanks for stopping by, Victoria! Thanks, Melissa. I can see this being right up your alley! Mmm, I love pizza and I love quesadillas so this is a home run for me!